The Mughal emperors collected European paintings and engravings, many of which were brought to the court in the late 16th and early 17th century by successive Jesuit missions who travelled to Delhi, Agra and Lahore from Portuguese Goa. The artists employed by the emperor Akbar (r. 1556-1605) often copied these exotic works of art.This painting of the Martyrdom of Saint Cecilia is a close copy of an engraving by Jerome [Hieronymus] Wierix. The painting is mounted on a decorated page formerly bound in an album compiled for Shah Jahan. Painting, opaque watercolour and gold on paper, the martyrdom of Saint Cecilia. Saint Cecilia lies on the floor, expiring, in front of a female companion who reaches towards her neck and while a second moves forward with a glass bowl of water and sponge. A putto at left flies towards her carrying a crown. The nimbate figure of Christ hovers in the clouds above. The Persian inscription giving the name of the artist is written in black ink in the border below the painting. This seal stamp in black ink appears to provide the name of an 18th century owner. The date seems to be 1161 of the Islamic era, corresponding to 1748 AD, but is slightly smudged. 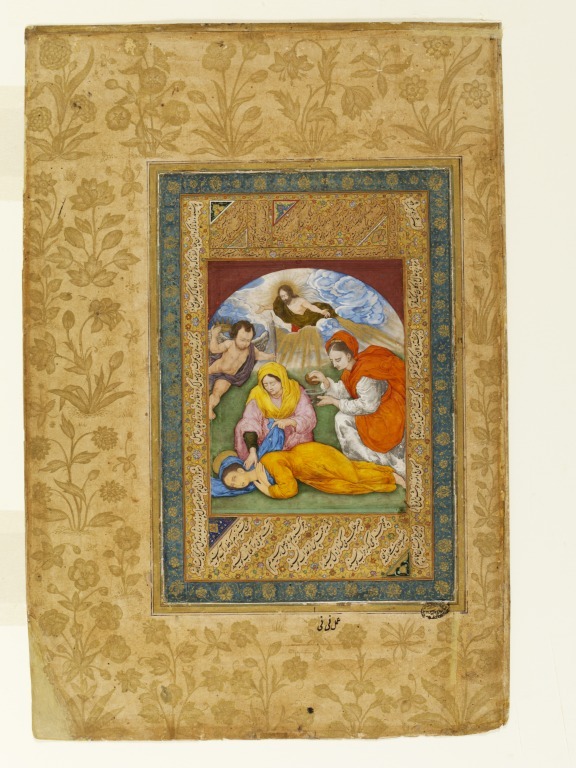 The painting is mounted on a page with decorated borders from an album made for the Mughal emperor Shah Jahan. Susan Stronge, Painting for the Mughal Emperor. 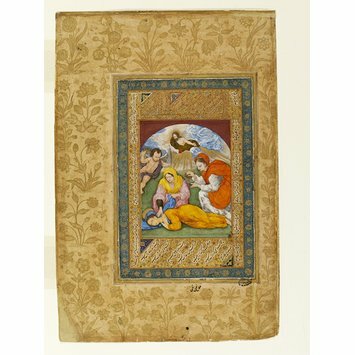 The art of the book 1560-1660, V&A Publications, 2002, pl. 70, p. 104.